Starting in San Diego, there’s a nice little bookstore and coffee house called The Upstart Crow in Seaport Village, a quaint tourist area on the water. If you’re on vacation in San Diego, want to spend some time relaxing with a book, a cup of coffee, and a pastry – this is the place. A fair selection of bestsellers and classics perfect for a summer read. Solvang is a Danish tourist town north of Santa Barbara and home to a couple of fun bookstores that are worth your time to browse through among all the pastry shops and souvenir places in Solvang. Valley Books has a unique collection of used books while the Book Loft is a much more traditional indie bookstore. I was able to get a copy of David McCullough’s, The Greater Journey just after it was published. Arizona’s best known Independent bookseller, they just do it right. New and used. They have an aggressive schedule of events, book signings, etc. Formerly located near ASU on Mill Avenue, I loved visiting. Their new location is in a nice neighborhood shopping area, but just lacks the U. District atmosphere. They’re opening a new booktsore in N. Central Phoenix in the location of a landmark restaurant, The Beefeaters, which closed in 2008. Hurray. These guys got me started with used books back in the late 80′s. I couldn’t walk out of that place without an armful of my latests finds. Now with stores in Phoenix, Mesa, and Flagstaff they’ve expanded into used CD’s, computer games, musical instruments, and more. It’s been a long time since I’ve visited, and I know their famous 4 story location in Cherry Creek is long gone, but it’s great to see that they are still around and evidently thriving. It was always busy when I visited and I remember trudging up and down the stairs, but a great place to hang out with all the nooks and crannies to get lost among the books. This might be the most famous U.S. bookstore on the list. I hope to visit in June. Founded in 1953 by Lawrence Ferlenghetti and home to the beat generation, CIty Lights hosted readings by Jack Kerouc, Allen Ginsberg, and others. Published Ginsberg’s “Howl” in their basement, and specialized in banned books. 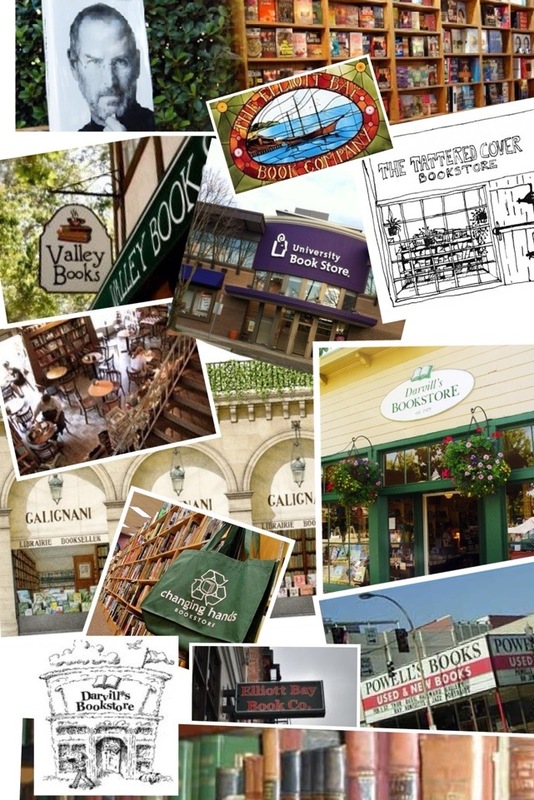 Nobody could create a list of favorite bookstores and leave off Powell’s City of Books. Occupying an entire city block in downtown, Powell’s bills itself as the largest new and used bookstore in the world. It is an amazing place – so fun to lose yourself among the bookshelves. Last time I visited their website, spent half an hour just browsing through their collection of rare books. It’s a must visit if your ever in the area, and some great restaurants and bars nearby. I’ve spent a lot of time (and money) at a special favorite indie bookstore of mine, Bellevue’s University Bookstore. This is the Eastside Branch of the mother ship official UW bookstore in Seattle’s U District. Pretty good selection of books, not to mention art supplies, UW attire, etc. Ask me about book darts. You may have trouble thinking of a University Bookstore as fitting on this list, but it does indeed qualify as an independent and is a co-op. Seattle’s legendary Elliot Bay Bookstore in Pioneer Square was next on my list, but I just discovered they’re gone! How sad. Good news – they’ve moved to a new location on Capitol Hill. Though I’ll miss the historic location, I’m excited to think about visiting the new on my next trip to Seattle. 11. Darvill’s – Orcas Island, WA. I’m out on a limb by listing an island bookstore that I’ve never been to as one of my favs. Been following Darvill’s on FB – thanks Vicki. They have all the right stuff. It’s a book lover’s heaven. A foreign entry to my favorite bookstore list. In the 20′s this bookstore was a sanctuary for a group of expats from the U.S. known as The Lost Generation: Hemingway, Fitzgerald, Gertrude Stein, etc. A struggling author couldn’t get his novel published so the bookstore owner, Sylvia Beach took a chance and published James Joyce novel, Ulysses. Sylvia Beach died many years ago. The “new” owner has had this location since the 50′s. Famous in his own right, George Whitman died in December 2011 at the age of 98. His daughter SYLVIA BEACH Whitman is now proprietor. My FINAL favorite bookstore (for now). Galignani’s in Paris. A spectacular location steps away from Angelina’s known for their macarons and rich hot chocolate and next to the luxury Hotel Meurice with its Michelin rated restaurant. Galignani’s is the oldest English language bookstore on the continent. The bookstore goes back to 1801, but the family has been in the publishing business since 1520. A beautiful bookstore (new only), superbly managed. This entry was posted in tourism, travel and tagged bookstore, denver, Orcas Island, Paris, phoenix, portland, san diego, solvang. Bookmark the permalink. Wonderful, wonderful places. Bookstores. We can’t let them go extinct!